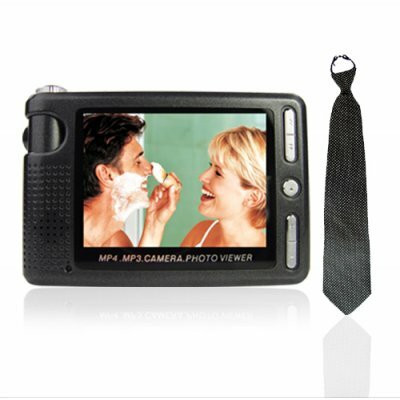 Successfully Added Tie Camera with MP4 Player 1GB Flash, 2.5-inch LCD to your Shopping Cart. The World's Smallest Color Pinhole Camera built-in the fashionable man's tie. When wearing this tie with your clothes, the camera lets you record exactly what you are seeing. No external power needed, just connect it directly with MP4 player to hidden recording so you will not miss any action. The included recorder can also act as a stand alone 2 MP camera and provide 320x240 Digital video capture for those times when secrecy is not needed. The CVDLM-STI01 is another great surveillance product only available from your source for wholesale direct from China electronic products, Chinavasion Electronics. Note: this product uses the PAL color system..
"GREAT SPY CAM I NEED LAST 5 MONTHS THS ITEM.GUD CAM AND RECORDER." have you bought this spy stuff? GREAT SPY CAM I NEED LAST 5 MONTHS THS ITEM.GUD CAM AND RECORDER.